In August last year I travelled for the first time to the northern hemisphere. It was a whirlwind tour, only a month away from home, and I managed to see so much yet I know I barely scratched the surface of the places that I visited. I firmly believe you could spend your whole life in London or Rome and still not manage to see all they have to offer. With twelve months now passed, my memories have been distilled into vivid moments when I knew I was in a different place or could feel the echoes of those who had been there before me. It is unsettling to arrive so quickly on the other side of the world – twenty-four hours travel when at the time my forebears arrived in Australia the journey took three or four months. The light is softer, the sun is in the wrong place in the sky – I felt almost as if I were in a dream. Two days on, as I climbed the stairs from Westminster station, Big Ben rose up before me and I realized, almost with a shiver, Yes, I was in London. And there was so much to see and do. At every stop on my journey, there were moments that were unique to each place visited. A visit to the Globe at Southwark was the opportunity to experience, in a small way, the Elizabethan theatre. The orderly crowd was far better behaved than any Elizabethan or Jacobean audience. Macbeth was utterly thrilling and absorbing, allowing the imagination to take flight in a way a film loaded with lush scenery and special effects cannot. Despite suspecting that all the legends regarding its origins and powers might just be blarney, there was that sneaking hope that something of the gift of eloquence would seep into my writing. Leaving beautiful Killarney on a soft grey morning, I thought of my great great grandparents, Thomas and Mary O’Connor, who left there in 1839 to come as assisted immigrants to the infant colony of South Australia. Despite the trepidation and sadness they must have felt at leaving family and familiar surroundings, there would have been a tremor of excitement and a firm hope for a better future for their children. Sitting in the gloom of the dungeon of Norwich Castle, I tried not to imagine too clearly the experiences of the men and women herded together in the common cells five centuries ago. It was not until the 19th century that debtors, criminals, prisoners on remand and women were kept separately at Norwich although places like Newgate, Bridewell and even Bury St Edmunds had separate accommodation for men and women by the end of the 16th century. Part of my current work-in-progress, The Bridled Tongue is set in Norwich in the 1580s. A walk around Elm Hill and a visit to the Strangers Hall gave me a chance to sense the shape of the world my characters inhabit. Standing on the Scalzi Bridge towards dusk looking along the Grand Canal. Venice, a mysterious city floating on water, still entrances travellers as it has for centuries. The place where more Christians died than the Coliseum yet not frequented (fortunately) by many tourists. The beauty of the Roman Baths beneath the Victorian edifice at Bath, the slanted light almost from another time and place. St Nicholas Bathampton is the burial place of Arthur Philip, the first governor of New South Wales, honoured more here than, perhaps, in Australia. This is a place of quiet pilgrimage for many Australians though. We were the only people at the church on our visit but as we left another small group of Australians arrived. In the crypt of Canterbury Cathedral there was an overwhelming sense of age. Hushed and shadowed, aged paintings on the ceilings, worn flagstones, the faded scent of imagined incense called up awareness of the feet that had walked here many centuries before. The flickering candle set on the tiles of the Trinity Chapel where Thomas Beckett’s shrine once stood is a moving symbol of not only of St Thomas’s life but of the hopes of those who made the pilgrimage to his shine. 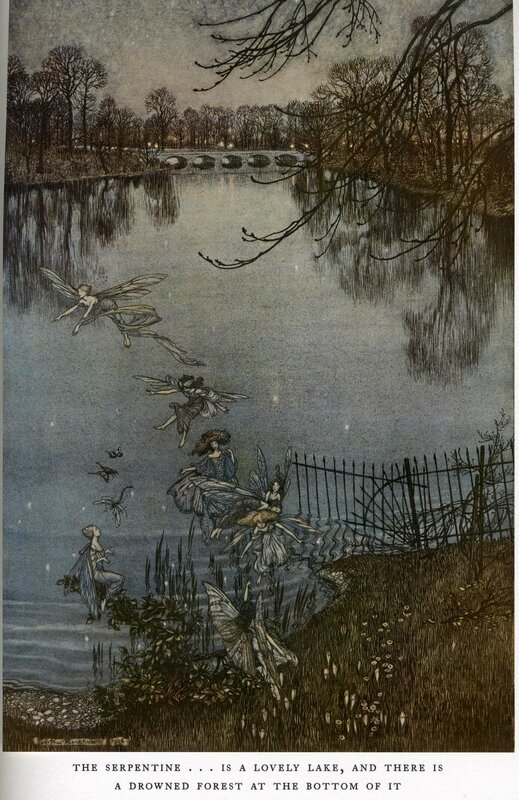 Standing on the bridge across the Serpentine in the rain, it is easy to imagine Arthur Rackham’s fairies at play. Not my photograph. The skyline was actually curved and the sky dark except for a deep red glow along the curve. And, coming into Abu Dhabi on the flight home, a sight I had never expected, the sun setting along the rim of the earth. While any photograph can stir a memory, I learnt while I was away not to take too many. It is more important to stand quietly and take in a place with all your senses. Once captured in your mind, one or two photographs are enough allow you to relive that other place and time.